Just 5 ingredients & yummy! 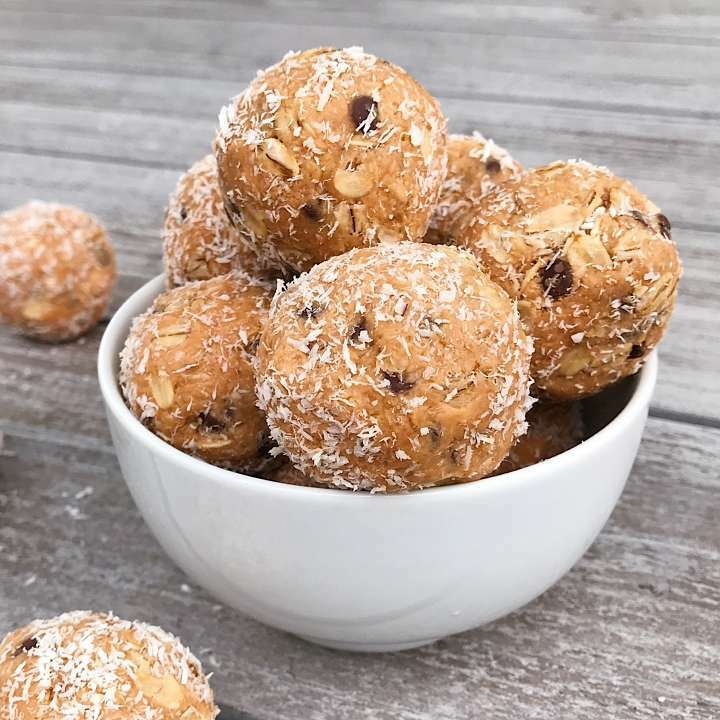 If you’ve followed the Healthy Gluten-Free Family a while, you know that we are big fans of energy bites, or “bliss balls” as many call them. They are our go-to snack, any time of day. There’s always a stash in our refrigerator and freezer of our favorite five-ingredient energy bite. 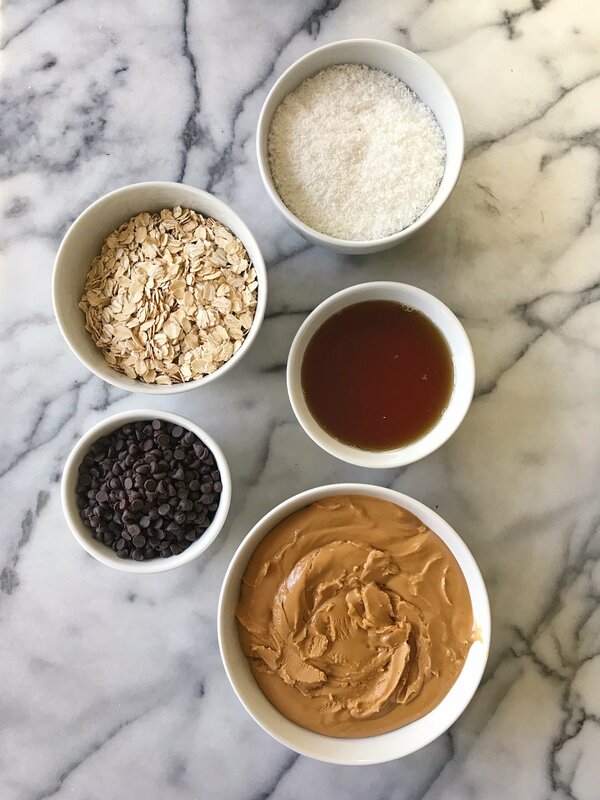 It’s made with Barney Butter almond butter, gluten-free oats, maple syrup, mini chips (we use Enjoy Life Foods mini chips), and shredded coconut. They are the perfect energy boost and we’ve been known to eat them at breakfast, on the go, for snacks or dessert… see how they disappear so quickly?! Also, super excited to share with you that I am now a Barney Butter Ambassador! Barney Butter is the only almond butter we use. And we’ve been using Barney Butter as long as we’ve been making these Energy Bites (which is a l o n g time!) … It’s Certified Gluten-Free, peanut-free, non-gmo and vegan and it’s the best flavor & texture. I’m convinced that the Barney Butter texture is what makes these almond balls hold their form so well. 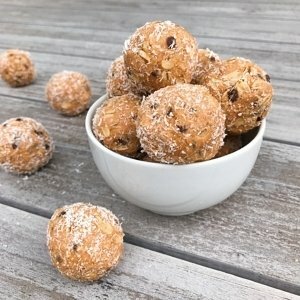 These 5 ingredient no bake bites are the perfect energy boost to fuel you through your day. The original recipe is from The Stand Juice. A perfect snack for young chefs to prepare! My daughter loved making these on this snowy no-school day; I loved the no-need-for-baking in case we lost power, and everyone else loved eating them! Thanks for sharing Monika! So glad you love them too! Looks delish and we love Barney butter at our house! We are currently off of oats… is there another substitute for them? We love Barney Butter too! Unfortunately, I’ve never made these without the oats. But have you tried the Walnut Date Bliss Bites? They are made with Barney Butter too but the oats are optional — I’ve made them both with and without, and both ways taste great! These are absolutely delicious. Exactly what I needed. I substituted date paste for the syrup. Still amazing. Thanks! Great idea! Thanks for sharing! And you happy you love them as much as we do!